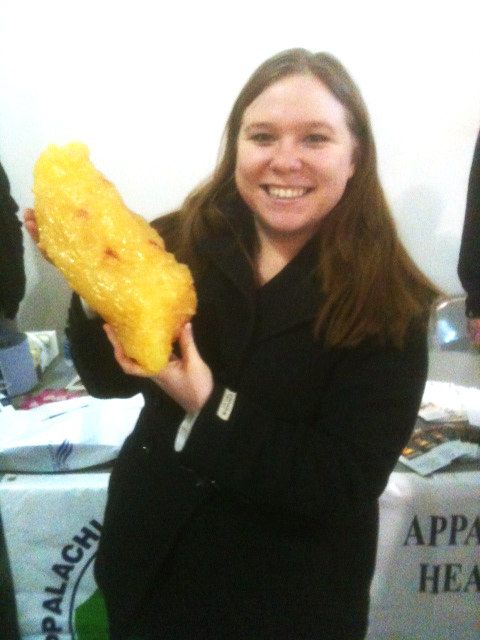 The fat mold I’m holding represents 10 lbs. I never thought I’d be so happy to hold a disgusting piece of fat. But look at it. In that moment, it was the most glorious, beautiful thing I have ever seen. You may think I’m crazy– and your assessment probably wouldn’t be completely wrong– but if you were me, I think you’d feel the same way. You see, that piece of rubber is supposed to resemble a certain amount of fat weight. Well I’ve lost destroyed MORE than that to date since January 1st. Somewhere and somehow, inside of me was all that goo and BAM! It’s gone thanks to lots of veggies, water and of course, exercise. When I saw that, I couldn’t help but feel empowered. The picture was taken in the middle of a health fair at work, and I think everyone around me thought I was nuts when I freaked out upon finding out the model was just one pound less than than my overall weight loss total. And of course, like a lunatic, I asked my coworker to take a picture of me with the fat. But while I’ve seen multiple pictures of fat representations on Pinterest, to actually have it in my hands was a whole other experience. It’s easy to get discouraged no matter what stage you are at reaching your goal, no matter what your goal is and no matter how much you have to achieve. But every little step counts and is often bigger than you think. This representation of fat is still far from where I want to be. But holding it in my hands and seeing the work I’ve done so far, it made me realize that what I’ve accomplished even in this short amount of time is important and is something to smile about. And the rest of my goal? Well, it’s sure to follow. Obviously. Because I’m going to make it happen. « So You Mentioned Babies, eh? Awesome!!!!! You should be so proud!!! Wow! Good for you Nikki. Seeing the fat mold and how much 10 pounds really looks like is much more motivating to me than seeing 10 pounds down on a scale.